The most hygienic hand dryer available on the market today. Meet the Sterillo. The real revolution in hand drying technology. 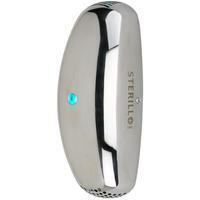 The Sterillo is the first and only hand dryer that also continuously disinfects washroom air. When it's not drying hands at 245mph, the Sterillo silently draws in bathroom air, blasting it with the same powerful germicidal light commonly used to disinfect hospitals. The UVC light kills airborne germs - which are released into the air with every toilet flush. By destroying the germs in bathroom air, the Sterillo eliminates odours, improves sanitation, prevents infection and ensures people never distrust your bathroom's hygiene. The Sterillo hand dryer speaks for itself in terms of being the perfect pub or restaurant hand dryer choice for anywhere needing a high specification proven stylish hand dryer. The Sterillo combines excellent hand drying power with Patented room sanitising technology that silently remove nasty smells and malodours. Gone are offensive odours, and their causes that fester in the average washroom. You can have a pleasant smelling washroom that’s pleasure to use rather than being something customers suffer through. In laboratory tests carried out by PHE* The Sterillo removed over 99% of one of the most common infectious bacteria in the washroom. The full test report is available to download here. The Sterillo concept is truly innovative and unique thanks to patented technology that allows the hand dryer to not only quickly and efficiently dry hands but also remove airborne bacteria*, leaving rooms smelling clean and fresh. Here at Handy Dryers we are delighted to say that we are the UK’s official retailer of the Sterillo Hand Dryer. This fantastic technology is all wrapped in a stylish design in three different high quality finishes – black, stainless steel and white – meaning that not only will the Sterillo improve the smell of the washroom but also provide a stylish and professional finish. The Sterillo is available in 4 different sizes – the Sterillo 5, 10, 20 and 30, suitable for washroom sizes of 5M² 10M², 20M² and 30M² respectively. The Sterillo uses a long established technologies that can destroy airborne germs, mould and viruses- - therefore removing most washroom odours. Ultraviolet Germicidal Irradiation (UVGI) is a sterilisation method that uses UV light at sufficiently short wavelengths to break down micro-organisms by removing their reproductive capabilities and effectively destroying them. Not only does the Sterillo use UVC light technology to its fullest; it also features the amazing hand drying technology. With an ultra-quick dry time of 8-10 seconds, ECO sensors to test ambient air temperature and adjust air heater power accordingly and a powerful airflow of 110 metres/second means that the Sterillo’s hand drying capabilities are second to none.